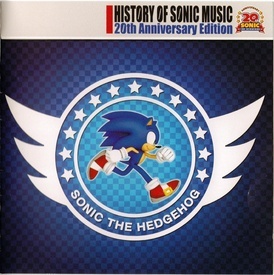 History of Sonic 20th Anniversary Edition is a two-disc compilation album containing a variety of music spanning the first 20 years of Sonic the Hedgehog's gaming career. Sharing only a handful of tracks with the similarly themed music CD included with the collector's edition of Sonic Generations, it was released at the tail end of SEGA and Wave Master's celebrations for the gaming icon, being their fifth overall. Two stickers are contained as bonuses - one being the cover logo, the second being one of the logos used for Sonic's 20th. This page was last edited on 9 October 2018, at 21:45.